Fancy a milk carton wallet? 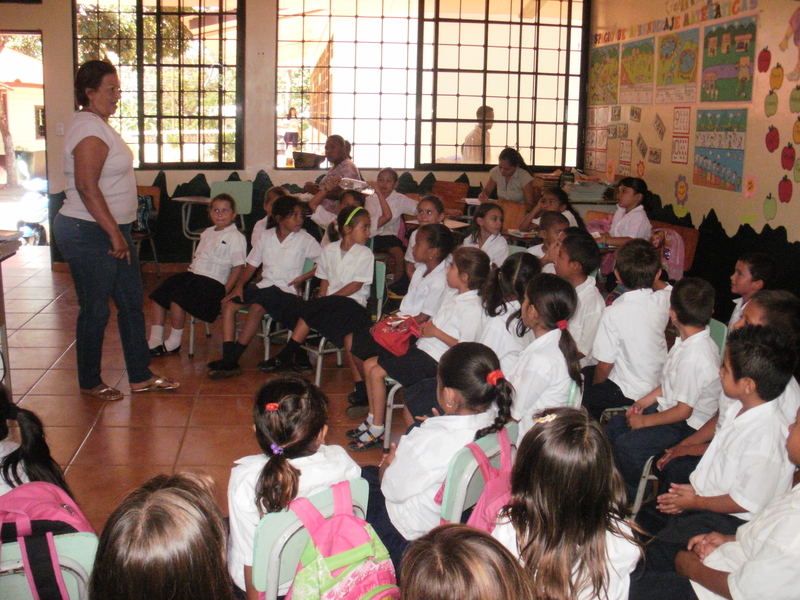 Here are the children at a local school recieving a presentation on recycling from Monica Perez (from BICA – Bay Islands Conservation Association, with whom we have a partnership) aided by two of our volunteers; Gemma and Dan. I say aided, however Dan’s attempt at putting his one month intensive Spanish course to use by speaking to the class failed miserably when the children didn’t understand a word he said. To comfort him we put it down to accent differences. The main content of the presentation was informing the kids on how long different types of rubbish take to biodegrade and how they can help save the environment by doing simple things such as squishing down bottles, not using plastic bags and re-using various materials. Milk cartons, for example, have been rapidly accumulating in the Iguana Station kitchen recently, at the request of Gemma and Carla who are dedicatedly making wallets out of them. Gemma revealed her wallet at a pizzeria the other night and it was admitabbly rather impressive, although lack of space for notes and coins is a glitch that needs to be rectified. Also the fact that, from the outside, there is no indication that it’s a wallet and really does took like a bit of cardboard that needs to be thrown away. However, the homemade wallets were well-recieved at a school on Jewel Caye as prizes for the colouring competetion. The children were very impressed. It’s probably best not to tell them that one of the prizes for the T-Shirt competion here on Utila is a cinema trip in which one kid gets to pick the film for his whole class. . . then they may feel a bit hard done by with their milk carton wallets. It’s heart-warming how generous some of the local businesses have been with donating prizes for our competetions; others include gigantic bags of sweets from Bush’s supermarket and a potential free Junior Fun Dive from Captain Morgan’s Dive Centre. Meanwhile, here at the station, nearly all the iguanas have been beaded with coloured beads for identification and have also had their pictures taken. Soon this will be up on the Adopt and Iguana blog for all to see. Some sad news now: poor old Iggy has ESCAPED. A couple of the volunteers were fixing a hole in the back of his cage before realising a) there were about seven other holes and b) Iggy was not in his cage. We are all quite attatched to Iggy after having to hand feed him every day so we are hoping he will turn up somewhere near his cage. After all, he can’t have gone far on those frail legs. To end on a happy note, Ray the Rat has had his cage re-vamped by Dan and it now features a rat hammock and a minature piano. This is, of course, because Ray is named after the legendary blind jazz musician Ray Charles. ~ by iguana123 on March 29, 2011. No! Iggy is an old Swamper that was found half dead on a road about a month or so ago. Thank Goodness! Swampie is 14 years old and He better be treated like royalty. He’s a legend.